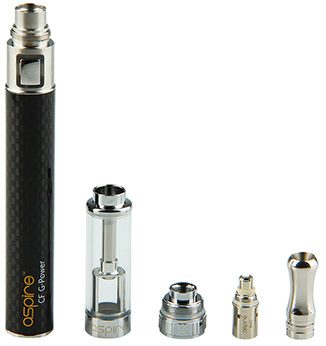 The Aspire starter kit comes with an Aspire G-Power 900mAh battery and a fresh K1 glassomizer. K1 glassomizer: The K1 is a new generation of glassomizer, which uses the Aspire “BVC” (Bottom Vertical Coil) atomizer technology. This new technology is designed to last longer while still giving users the purest and cleanest taste from e-liquids. The stainless steel drip tip and the pyre glass give the K1 a strong metallic impression, which makes it look very exquisite and high-end. This unique design also makes it easy to carry, install and refill. 5. Carbon Fiber Coated Tube. 1. Screw the G-Power battery into the K1 glassomizer. 2. Push the button on the battery (press 5 times in succession to turn ON/OFF), the LED will blink 3 times and the button will illuminate blue when active and ON. 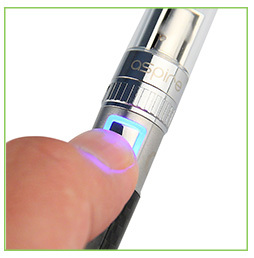 Press the LED button and inhale at the same time. Release the button after inhaling. The light indicates it is working. 2. 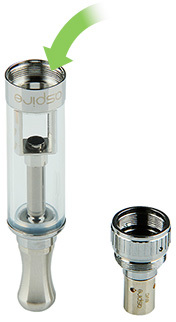 Use the syringer or dropper to fill less than 1.5ml e-liquid into the space between the glass tank and the center metal tube. Do not overfill it. Unscrew the battery from the vaping components and gently screw the battery into the dedicated USB charger provided in the kit. Plug the USB into the supplied A/C adaptor or computer. The battery will flash 3 times and then turn solid in color (Orange light in 3.2~3.5V, Blue light in 3.5V~ 4.15V). The light on the USB charger will be red when charging. It takes about 3 hours for the battery to charge. Once fully charged, the USB charger will display a green light and the LED light on battery will turn off.